RG Technologies offers a range of training courses for the different requirements in the various software fields. Our courses take place either in our training centre or at the customer site. Please contact us to find your optimal training. The CCAD Workshop is designed for people who want to learn CAD, and wish to determine by the example of their own models, whether CCAD is suitable for their design requirements. The CCAD Workshop can be extended on request to the advanced module PDM with BOMs, Work Sheets and Production Orders . 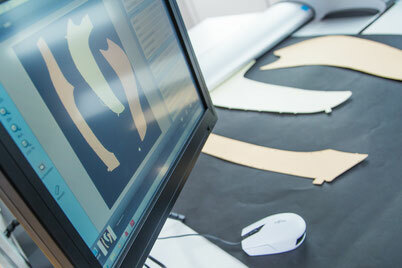 As part of the CCUT Workshop we organize cutting tests together with the customer on its materials. There are determined metrics for materials. These include, for example tools and knives for the individual materials, settings at the table as accelerations and velocities. The aim of the workshop is to give an accurate indication about the optimal configuration and the expected production rate with an automatic cutting system. The course is designed for CCAD beginners. This can be CAD newcomers or users upgrading from other systems on CCAD. The course mainly targets industries such as shoe and leather goods industry, developers of automotive interiors and furniture production. We intensively discuss the basic functions that are required, to create a ready for production model. 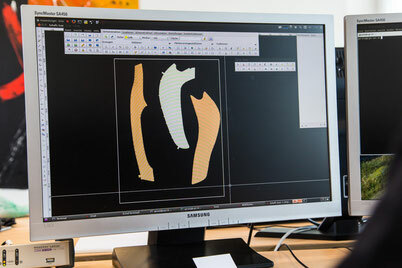 Modelling with all the necessary functions such as offsets for underlays, seams, folding edges etc. 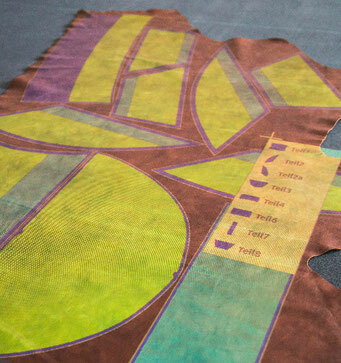 Creation of patterns including notches, roundings, edges, marking splines, super-lines, inside elements and cut-outs. Edit patterns, for example copy with and without inside elements, changing pattern names. This course is based on CCAD Basic. The course designed for users who are already working with CCAD and have profound knowledge. 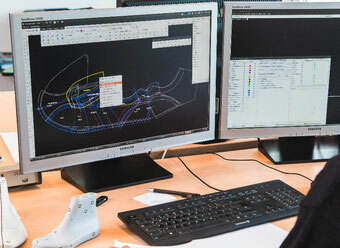 It imparts functions which facilitate the technical design of the models and make work more efficient. Edit patterns by insert, remove and change elements. The CCAD Refresher Course is suited for users who are already working with CCAD. During the course we work out solutions for specific tasks in modelling. It can also be used to see gridlocked work flows under a different angle and optimize them. Elaboration and optimization of work flows for certain design characteristics of different models. The CCAD Digitizer has been specially developed for large-format patterns as they are in use in the furniture industry and at automotive suppliers. The course aims to teach you how the digitizer can be optimally integrated into the production process for the import of patterns to CCAD. This course is aimed specifically at technical modellers of the footwear industry. It includes the offer CCAD Basic and and goes beyond explicit problems and tasks in the construction of shoe models. This course can be combined with the courses CCAD Basic or CCAD Shoes. CCAD Orthopedics is an advanced training course specially for orthopedic shoemakers. Its specific interest lays on the subject orthopedic lasts and made to measure production. The course CCAD Grading is relevant only for users from the footwear industry. Here it is trained how to create single sizes based on the established size systems like English or French. This course builds on the course CCAD Grading. Grading of boots id specifically considered in this course. The course CCAD PDM builds not on the CCAD courses for technical design. The content of this course is independant from the area design. No previous experience in the field of CCAD Design is required. Depending on requirements, the different areas of the PDM Module are trained. The course CCAD Material Costing is not based not on the courses for CAD Design and PDM. There is no additional basic knowledge required. The course deals only with the consumption calculation of existing models. Advanced course on CCAD Basic and CCAD Advanced. This course is aimed specifically at users who want to intervene administratively in the system and those who act as superuser at customers with multiple CAD stations. Content of this course is to create output forms for each CCAD module. The forms can be printed directly on CCAD, or saved as a PDF and sent. This course is designed for CCUT beginners and constitutes the basis for working with automated cutting systems. CAD skills are not required. The course is specifically tailored to the trainees and varies depending on the used cutting solution. The the CCUT Advanced course requires prior participation in CCUT Basic course. The course is mainly aimed at maximum optimization of cutting time and material utilization. The CCUT Refresher course helps the user becoming more efficiently. It also provides functions that can support during everyday use of the system. Precondition for CCUT Statistics course is knowledge of CCUT. In this course all the statistics and control functions which are part of the system are mediated. It is worked out together how the statistics can support the user in increasing its productivity.